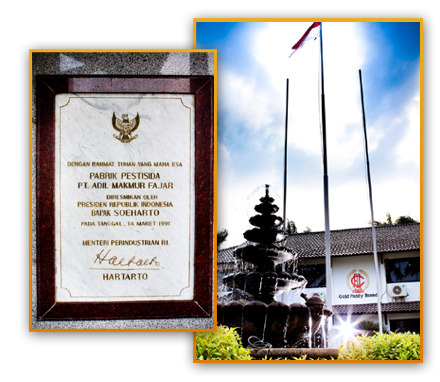 PT Adil Makmur Fajar (AMCO) was established in Tangerang, Indonesia in 1988. Engaged in the field of agrochemicals, PT Adil Makmur Fajar is a producer of technical materials and formulations for the production of Agrochemicals, such as Herbicides, Insectisides, Acaricides, Fungicides, Molluscicide and Plant Growth Regulators. With a total number of employees having reached 150 as of January 2012, PT Adil Makmur Fajar has now become one of the large-scale agrochemical producers competing with a variety of international and local brands in Indonesia. As its establishment, PT Adil Makmur Fajar was one of the pioneers in the production of technical materials such as Glyphosate Acid 95% Tech and Formulations on a national scale. Through research and development, in 2005 a new breakthrough was made with a technological innovation that resulted in PT Adil Makmur Fajar becoming the only company in Indonesia to produce Paraquat Dichloride 42% Tech with an ammonia process that is free from the content of terpyridyl and bipyridyl which harmful to the environment.